This week the “Pension Fund Global” was worth Nkr7.3 trillion ($882 billion), more than double national GDP. No sovereign-wealth fund is bigger (see chart). It owns over 2% of all listed shares in Europe and over 1% globally. Its largest holdings are in Alphabet, Apple, Microsoft and Nestlé, among 9,000-odd firms in 78 countries. Other funds might copy those structures, but would struggle to mimic the Nordic values that underpin them. Yngve Slyngstad, its boss, says growth came “faster than anyone had envisaged”, and that a culture of political trust made it uncontroversial to save as much as possible. A budgetary rule stops the government from drawing down more than the fund’s expected annual returns (set at 4% a year). The capital, in theory, is never touched. Martin Skancke, who used to oversee the fund’s operations from the finance ministry, attributes the trust the institution enjoys to relatively high levels of equality and cultural homogeneity. It also helps that many rural areas recall poverty just two generations ago. Consider this your regular reminder that the “resource curse” is not a universal phenomenon. See also Botswana, the United States, Chile, Canada, and Australia. Was the Election in Gabon rigged? Thanks to the last minute Haut Ogooué results, Mr. Bongo was able to win by a margin of 5,594 votes, securing 49.8% of the vote to Mr. Jean Ping’s 48.2%. Opposition representatives refused to sign papers validating the results. According to the electoral commission, 99.9% of Haut Ogooué’s population casted their votes at the ballot boxes, which is a slight anomaly to the rest of the country where the average turnout was 59%. A career diplomat, Ping, who previously served as the chairman of the African Union Commission, disputes the result. “To use one province to impose a coup in the country could have serious consequences for national unity,” Ping said. Ping, of course, is the same guy who while at the AU Commission (2008-2012) turned a blind eye to instances of election fraud in several African states. It will be interesting to see where he turns to for help. Meanwhile protesters burned down the Gabonese Parliament yesterday. Authorities then blocked the internet early Thursday. The Bongo family has ruled Gabon since 1967. Ali Bongo became president in 2009 following the death of his father Omar Bongo who was president for a staggering 42 years. 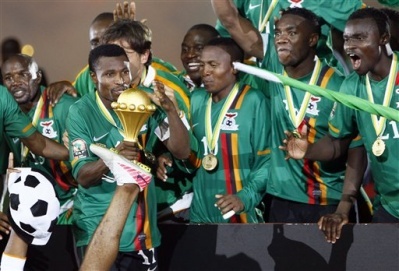 Congratulations to the Chipolopolo and their fans all over the world! His father ruled Gabon, an oil and timber rich nation of 1.4 million, for 42 years. The elder Bongo passed away this year and was succeeded by his son Ali Ben after a disputed election. Nobody really expected things to turn out otherwise. That said, one hopes that Ali Ben will feel the need to make things a bit better for the hundreds of thousands of Gabonese who continue to be shut out of the wealth from oil and timber. Gabon is Africa’s fourth largest oil producer and its second largest timber producer. During Omar Bongo’s 42 year presidency most of this money ended up in private bank accounts – the late president was the subject of an investigation involving Citibank, where he held millions of dollars in a private account. I don’t have much on the younger Bongo. He seems like a non-starter. If we are to believe the BBC the only notable thing he said after being sworn in as president yesterday was that he wants renewal within the Gabonese elite. May be by this he means more social mobility. The VOA quoted him to have said that he plans to end corruption and injustice – one wonders where he was during his father’s failed 42-year presidency (apologies, the WSWS was the only place I could find a history of the guy). I would have wanted to hear him say something about oil and timber and redistribution of Gabon’s national wealth. I mean, how hard can it be to run a nation of 1.4 million? With all that oil wealth Gabon could give Botswana a run for its money. Ali Ben owes Gabon a lot. His father stole from the country. He now has a chance to make up for it by putting the nation on the path to decency. This is not too much to ask, is it? Omar Bongo, the president of Gabon and Africa’s longest serving ruler has died. Mr. Bongo had intestinal cancer and had gone to Barcelona, Spain for treatment. He took over power in 1967. The African state of 1.5 million has considerable oil reserves, timber and manganese deposits and enjoys a per capita income of a middle income country – at US $14,400 according to the CIA Factbook. But due to a high level of income inequality, hundreds of thousands of Gabonese still live in poverty. Gabon was ranked 116th on the 2007/2008 UNDP Human Development Report. Like most mineral-rich African countries, corruption is endemic in Gabon. For instance, earlier this year anti-corruption activists accused president Bongo of buying French property with proceeds from corruption. According to the constitution of Gabon, the head of the country’s senate will be the interim president until elections are held within 90 days.